The Greek island of Santorini is nestled between Greece and Crete in the Aegean Sea. With an interesting history going back centuries, Santorini is the postcard paradise you imagine when you think of Greece. White washed towns descend down mountainsides with winding cobbled streets leading to volcanic pebbled beaches and bright blue seas. The volcanic nature of the island’s beaches such as vertical cliffs, bizarre rock formations and even black sand are the result of an eruption which happened in 17th century B.C. It’s also the reason for the island’s iconic crescent shape. 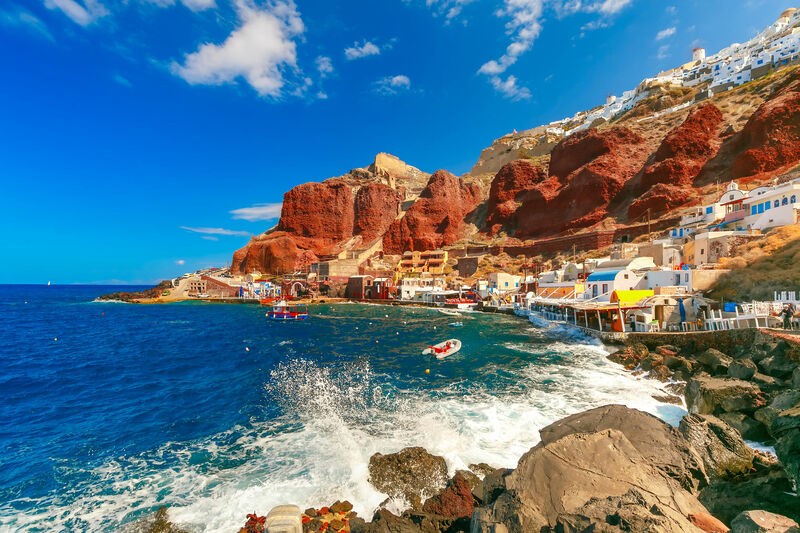 With a mid-summer average high of 30°C, Santorini is a popular tourist destination and welcomes people to learn about its history, enjoy the stunning views and bask in the beautiful weather. During summer, the surrounding sea is a lovely temperature for swimming. As Santorini is in the Mediterranean, north and north easterly winds blow across the island year round which can be a great relief when the days are especially humid. Oia is the most iconic part of Santorini with its white houses scattered across the hillside, blue topped churches and narrow winding streets. As one of the most photographed places in Greece, Oia is a must see. 300 steps below the town of Oia in the north western part of Santorini is Amoudi Bay. This port is not only described as one of the best places to swim on the island but also boasts tavernas selling fresh fish dishes such as traditional sun dried squid. Surrounded by red cliffs you can enjoy the atmosphere and watch the boats sail in as the sun goes down. Located in the south western area of the island is an archaeological site in Akrotiri. The excavations reveal a greatly preserved prehistoric ancient city which was smothered by the volcanic eruption. The amount of items and structures that have been uncovered make the site one of the most important in the Mediterranean. The excavations are open to visitors so you can explore the ruins and imagine the Minoan civilisation that once lived there. The site opens April-October from 8:00-20:00 every day and November-March from 8:00 to 15:00 every day except Monday. Admission is 5€ per person. Atop a hill in Imerovigli Village is Skaros Rock. For 600 years a castle was located here until an earthquake in the 19th century pulled it down. Now, remnants of the castle can be seen on Skaros along with phenomenal views across the Aegean Sea. Although there is a hike to the top, there are restaurants and bars for you to refresh yourself. Ancient Thera, also known as Thira, is an excavation site in the south eastern area of the island on a headland called Mesa Vouna. The surrounding beaches Kamari and Perissa were ports for the village that once stood there. The ruins include Hellenistic, Roman and Byzantine remains so will interest anyone interested in history through the ages. 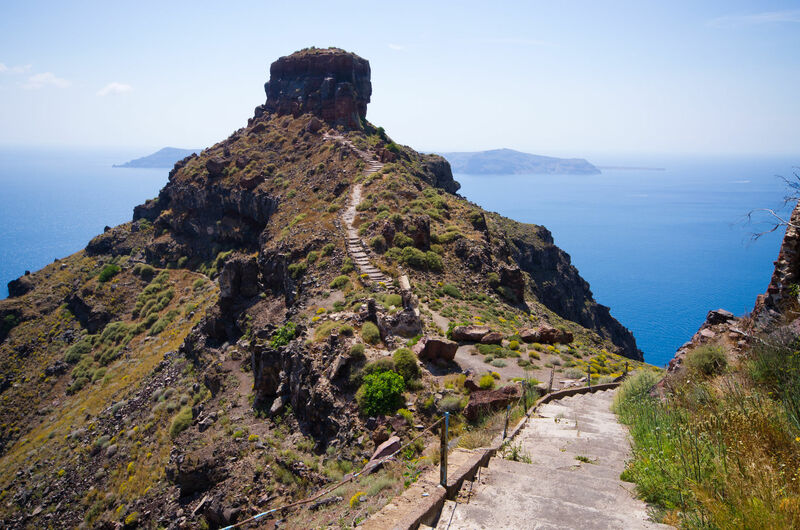 But even if the history of the ruins doesn’t interest you, the hike or drive to the top will still be rewarded as the view from the top of Mesa Vouna is incredible. Santorini is home to numerous monasteries, churches and cathedrals. Within the capital city of Fira, which derives its name from Santorini’s ancient name ‘Thira’, is the Orthodox Metropolitan Cathedral. Although the cathedral had to be reconstructed in 1956, the building is beautifully designed and as good as new. The whitewashed arched walls and domed roof are of classic Grecian style and frescoes inside the church have been painted by a local artist. 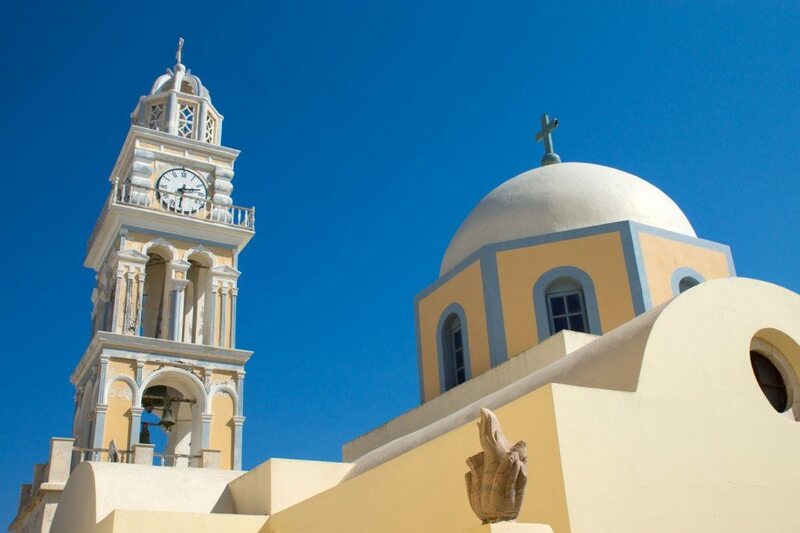 Also in Fira is the Catholic Cathedral which is dedicated to St John the Baptist. Similar to the Orthodox Cathedral, it has a domed roof but stands out with its peachy coloured walls and tall clock tower. As mentioned earlier, Santorini’s volcanic eruption has produced some interesting landscapes and therefore has beaches of different textures to what you may have seen before. Kamari beach is located south east from Fira along the eastern coast and boasts unusual black sand and volcanic pebbles. There are plenty of sun loungers and parasols on the beach as well as an abundance of bars and restaurants to sit and enjoy Greek cuisine and look out over the deep blue sea. Perissa and Perivolos beaches are next to each other on the south eastern coast and also have black sand. There’s lots of restaurants around so you won’t be short of places to eat. If you’re thinking of visiting these black sand beaches, be sure to bring flip flops as the sand gets very hot! Monolithos beach is great for families as there’s lots to do. Located near Kamari, the beach has shallow waters making it safer for younger children. There’s also a basketball court and football pitch. Sun loungers are supplied and restaurants and cafés are close by making it easy to get refreshments. 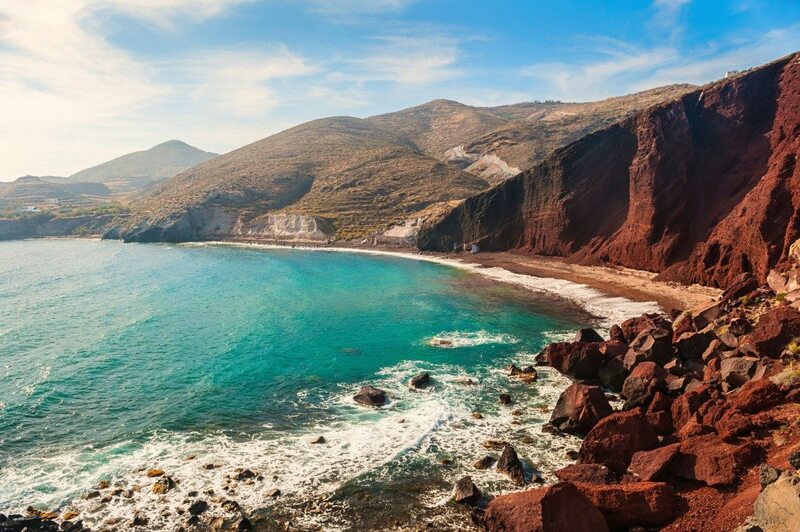 Although not very large, Red beach, also known as Kokkini Paralia, acquires its name from the red and black colouration of the volcanic rock surrounding it and the red pebbles along the shore. Even if the beach is packed, it may be worth a visit just to admire the stunning scenery as it is one of Santorini’s most famous beaches. Next to Red beach is White beach which, as the name may indicate, is surrounded by white rock faces and white pebbles. White beach, also known as Aspri Paralia, is only accessible by boat or on foot. If a private villa on a cliff top overlooking deep blue seas sounds like your idea of paradise, then look no further than Celestia Grand Exclusive Villas. A collection of six luxurious villas follow the whitewashed Grecian style. A spacious terrace with sun loungers, a private pool and a backdrop of the Aegean Sea create the recipe for pure bliss. This beautiful five star adult only hotel is built into the hillside which provides an incredible view across the sea from your own private terrace and pool. Due to the positioning of the terraces, you can watch the sun set over the Aegean Sea. Ambassador Aegean Luxury Hotel & Suites is only a 5 minute drive to the ancient settlement in Akrotiri and 1.5km to the Red and White beaches of Santorini. If you can hear the blissful setting of Santorini calling your name, ring one of our travel experts on 0800 047 1066 and book your luxury holiday. We always like to hear from you about your experiences so let us know if you’ve been to Santorini before in the comments!